• Homogeneous assay for cell viability, proliferation, cytotoxcity and evaluation of anticancer agents. • Sensitive and accurate. As low as 950 cells can be accurately quantified. • Fast. High-throughput assay using 96-well plates allows simultaneous processing tens of thousands of samples per day. • Robust and amenable to HTS. Z factors of 0.5 and above are observed. Can be readily automated with HTS liquid handling systems. • The study of cell proliferation and cell viability requires the accurate quantification of the number of viable cells in a cell culture. Therefore, assays for calculating cell viability are necessary for optimizing cell culture conditions, evaluating cell growth factors and nutrients, discovering novel antibiotics and anti-cancer drugs, evaluating toxic effects of environmental pollutants and cell mediated toxicity and studying programmed cell death (apoptosis). The CellQuanti-MTT™ assay kit provides a convenient, sensitive, quantitative and reliable assay for determining the number of viable cells in a given culture. This homogeneous colorimetric assay is based on the conversion of a tetrazolium salt MTT, a pale yellow substrate, to formazan, a purple dye. This cellular reduction reaction involves the pyridine nucleotide cofactors NADH/NADPH and is only catalyzed by living cells. The formazan product has a low aqueous solubility and is present as purple crystals. Dissolving the resulting formazan with a solubilization buffer permits the convenient quantification of product formation. The intensity of the product color, measured at 550 - 620 nm, is directly proportional to the number of living cells in the culture. Reagents in the kit have been carefully formulated and optimized for sensitivity, assay robustness and automation. 1. Oxelmark, E et al (2006). The cochaperone p23 differentially regulates estrogen receptor target genes and promotes tumor cell adhesion and invasion. Mol Cell Biol. 26(14):5205-13. Assay: Cell Viability in Human cell lines (Pubmed). 2. Gupta, V et al (2009). Fabrication and characterization of silk fibroin-derived curcumin nanoparticles for cancer therapy. Int. J. Nanomedicine 2009:4 115?122. Assay: Cell Viability in Human cells (Pubmed). 3. Zhang, Y et al (2009). Estrogen inhibits glucocorticoid action via protein phosphatase 5 (PP5)-mediated glucocorticoid receptor dephosphorylation. J Biol Chem.284(36):24542-52. Assay: Cell Viability in Human MCF-7 cells (Pubmed). 4. Cheng, H et al (2010). Transient receptor potential melastatin type 7 channel is critical for the survival of bone marrow derived mesenchymal stem cells. Stem Cells Dev. 19(9):1393-403. Assay: Cell Viability in Mouse mesenchymal stem cells (Pubmed). 5. Chen, TS et al (2010). Delineating biological pathways unique to embryonic stem cell-derived insulin-producing cell lines from their noninsulin-producing progenitor cell lines. Endocrinology 151(8):3600-10. Assay: Cell Viability in Mouse stem cells (Pubmed). 6. Desplats, PA et al (2008). Functional roles for the striatal-enriched transcription factor, Bcl11b, in the control of striatal gene expression and transcriptional dysregulation in Huntington’s disease. Neurobiol Dis. 31(3):298-308. Assay: Cell Viability in Human cells (Pubmed). 7. Nelson, GN et al (2008). Initial evaluation of the use of USPIO cell labeling and noninvasive MR monitoring of human tissueengineered vascular grafts in vivo. FASEB J 22 (11): 3888-95. Assay: Cell Viability in Human cells (Pubmed). 8. Haidar, ZS et al (2009). Modulated release of OP-1 and enhanced preosteoblast differentiation using a core-shell nanoparticulate system. J Biomed Mater Res A. 91(3):919-28. Assay: Cell Viability in Mouse preosteoblast cells (Pubmed). 9. Poh, CK et al (2010). The effect of VEGF functionalization of titanium on endothelial cells in vitro. Biomaterials 31(7):1578-85. Assay: Cell Viability in Human endothelial cell (Pubmed). 10. Harbison, RA et al (2011). Calpain plays a central role in 1-methyl-4-phenylpyridinium (MPP+)-induced neurotoxicity in cerebellar granule neurons. Neurotox Res. 19(3):374-88. Assay: Cell Viability in Rat primary cells (Pubmed). 11. Kalaivani, T et al (2011). Free Radical Scavenging, Cytotoxic and Hemolytic Activities from Leaves of Acacia nilotica (L.) Wild. ex. Delile subsp. indica (Benth.) Brenan. Evid Based Complement Alternat Med. 2011:274741. Assay: Cell Viability in Human Hela cell line (Pubmed). 12. Roopan, SM and Khan, FRN (2011). SnO2 nanoparticles mediated nontraditional synthesis of biologically active 9-chloro-6,13-dihydro-7-phenyl-5H-indolo [3,2-c]-acridine derivatives. Med. Chem. Res. 20(6): 732-7. Assay: Cell Viability in Human erythrocytes (Pubmed). 13. Yonei, N et al (2007). Induction of PDGF-B in TCA-treated epidermal keratinocytes. Arch Dermatol Res. 299(9):433-40. Assay: Cell Viability in Mouse keratinocytes, fibroblasts (Pubmed). 14. Du, Y et al (2008). Oridonin confers protection against arsenic-induced toxicity through activation of the Nrf2-mediated defensive response. Environ Health Perspect. 116(9):1154-61. Assay: Cell Viability in Human cell lines (Pubmed). 15. Andr?, FM et al (2010). Gadolinium blocks membrane permeabilization induced by nanosecond electric pulses and reduces cell death. Bioelectrochemistry 79(1):95-100. Assay: Cell Viability in Mouse cell lines (Pubmed). 16. Yoshida, H et al (2010). The citrus flavonoids hesperetin and naringenin block the lipolytic actions of TNF-alpha in mouse adipocytes. Biochem Biophys Res Commun 394(3):728-32. Assay: Cell Viability in Mouse adipocytes (Pubmed). 17. Khanna, VG et al (2010). 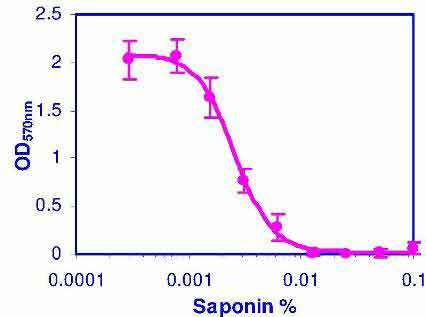 NON-PROLIFERATIVE ACTIVITY OF SAPONINS ISOLATED FROM THE LEAVES OF GYMNEMA SYLVESTRE AND ECLIPTA PROSTRATA ON HEPG2 CELLS- IN VITRO STUDY. JPSR 1(8): 38-42. Assay: Cell Viability in Monkey Vero cell line (Pubmed). 18. Khanna, VG, Kannabiran, K (2009). Anticancer-cytotoxic activity of saponins isolated from the leaves of Gymnema sylvestre and Eclipta prostrata on HeLa cells. Int J Green Pharm.3:227-9. http://www.greenpharmacy.info/text.asp?2009/3/3/227/56280. Assay: Cell Viability in Human Hela Cells (Pubmed). 19. Padmini, E et al (2008). Differential HSP90 expression in fish hepatocytes from polluted estuary during summer. Fisheries Science 74(5): 1118?26. Assay: Cell Viability in Fish Grey mullet hepatocytes (Pubmed). 20. Roopan, SM and Nawaz, FR (2009). Synthesis, antioxidant, hemolytic and cytotoxicity activity of AB ring core of mappicine. ARKIVOC 2009 (xiii) 161-169. Assay: Cell Viability in Human cell lines (Pubmed). 21. Suthindhiran, K and Kannabiran, K (2009). Cytotoxic and Antimicrobial Potential of Actinomycete Species Saccharopolyspora salina VITSDK4 Isolated from the Bay of Bengal Coast of India. Am. J. Infect. Diseases 5 (2): 90-98. Assay: Cell Viability in Mouse Hela Cells (Pubmed).